Former Sen. Scott Brown (R-Mass.) made a particularly nasty comment about Bernie Sanders last month in an interview aired, quite unsurprisingly, on Fox News. The comment was about Sanders' hair, and I described it as particularly nasty because, come on, insulting someone's appearance is a pretty low blow in any industry. Brown said of the current presidential hopeful, "When he was in the Senate, you look at him, and it was like, 'Bernie, stop spitting and comb your hair, man,'" and implored the show's hosts to tell him too. Personally, I'm a big fan of Bernie Sanders' hair; its varying styles are very telling of what his true moods, feelings, and attitudes are in a situation, and aren't the best politicians the most transparent ones? 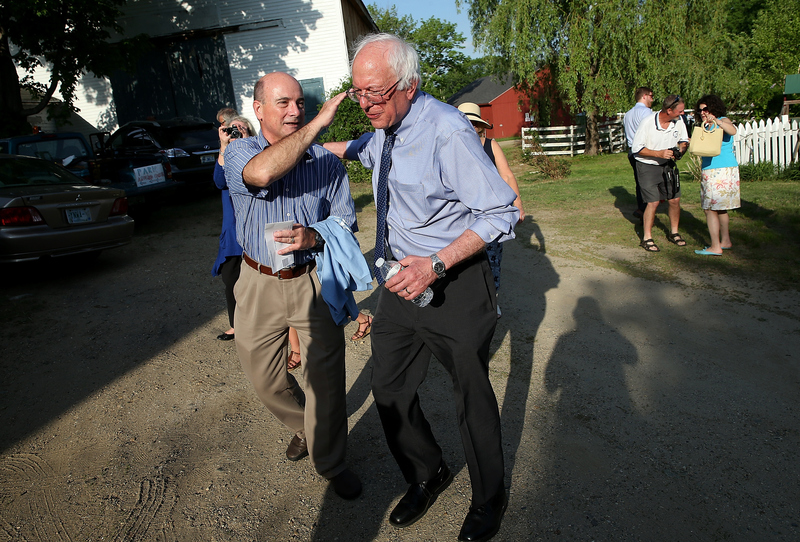 The Washington Post has captured some pretty intense photos of Sanders' carefree, scruffy style, and New York and BuzzFeed have both run stories on not only the Vermont senator's interesting hair, but the mass attention it's been receiving lately. Sanders' character reflects his hair's aforementioned "transparency" when it comes to his moods: He's called himself an "honest, scandal-free" politician, and some of his followers even fear that Sanders is too honest to be the next POTUS. He certainly has a tendency to back up his big claims about the evils of Wall Street with real numbers, but you know what's even more revealing than all of those shocking wealth inequality statistics, combined? His hairstyles. You can try to hide the frustration in your face, Bernie, but you can't hide it in your hair. While this photo probably wasn't taken during Sanders' heated May 2011 debate with Sen. Rand Paul (R-KY) about health care, it captures how Sanders probably felt when Paul compared government-provided health care to slavery. Yes, on the outside Sanders handled his "Republican colleague's" bizarre comments with a sense of humor, but on the inside, I don't doubt he was as agitated and hostile as his hair in the above photo. Sanders and his followers can only hope that his numbers will continue to rise — hopefully as high as his hair does in this picture. His fluffy locks were probably styled just like this in ecstatic response to surges of support for Sanders in Iowa and New Hampshire. Alright, sure — it's literally the job of a columnist covering politics to be critical and cynical, but nonetheless, I'm sure articles by The New York Times slamming Sanders' chances are pretty big mood-killers for him, his campaign team, and definitely his hair. In the photo above, you can tell by his facial expression that the Democratic socialist isn't too happy, but you can only feel and understand the hurt by looking at his hair. Dejected, flat, and giving off the vibe that (literally) no one cares for it, his hair just screams: "I could use a bit more respect around here." Just look at the rough winds tousling Sanders' hair in this photo, captured outside in the cold Washington, D.C. air. Sanders declared war on the billionaire oligarchs long ago, and although, in the picture above, the frigid outdoor temperatures have contorted his face into a mild, not-so-threatening snarl, his hair has channeled the winds of winter to send a vicious message to the enemy: Billionaires on Wall Street — winter is coming for you. Is it just me, or do his ferocious, snowy locks literally scream "I'm going to close your tax loopholes, increase taxes for you, and free the middle-class you've enslaved?" At the beginning of his presidential bid, Sanders definitely had plenty of Americans confused by what it means to be a socialist. Since then, he's attracted a substantial amount of support for his economic platform and has contributed to mitigating the stigmas around the word "socialist" in an aggressively capitalist nation like America. If you ever find yourself confused by any of the heavy statistics he refers to in a speech, or his strategies for making college free, I can't help you too much, there. But if you're ever confused by what mood the presidential hopeful is in, or what big news he's about to drop, here's a piece of advice from me to you: Look at his hair.